Home » Lifestyle » Why Iranians don’t Wear Ties ? Why Iranians don’t Wear Ties ? Until recently no one was aware of this nor did it ever strike anyone that Iran President Ahmadinejad never wore a tie no matter how important the event he was attending was. 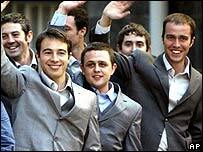 The British captives that were recently released by Iran all wore similar attire to that of President Ahmadinejad. You guessed it right, none of them wore ties. The dress they wore at the time of release was provided by the Iranian government. Its not that they forgot or didn’t have any ties. Ties has been prohibited by supreme leader, Ayatollah Sayyid Ali Khameini as he considered them to propagate western culture. The practice stems from the 1979 Islamic revolution when the monarchy was overthrown and a unique Islamic republic was declared, in which religious clerics – headed by Ayatollah Khomeini – wielded ultimate political control. Neckties – and bow-ties – were said to be decadent, un-Islamic and viewed as “symbols of the Cross” and the oppressive West. Iranians were told to wear “standard Islamic garments” designed to remove ethnic and class distinctions reflected in clothing. Nowadays ties are still frowned on as “the influence of westernization” on the way Iranians, especially young people, dress. Ties are “highly politicized clothing” in Iran, says the BBC’s correspondent in Tehran, Frances Harrison. Nearly all men – particularly government workers – do not wear ties. Because they are not clerics their usual dress consists of suit or trousers and long-sleeved shirts with collars, as championed by President Ahmadinejad. But while ties are said to be prohibited by the country’s supreme leader, some men wear them very occasionally, says Dr Andrew Newman, senior lecturer in the Department of Islamic and Middle Eastern Studies at the University of Edinburgh. Iranians on the other hand don’t have any issue with foreigners wearing ties. They understand that they wear it as a mark of respect and hence they do not even mention about their rule.